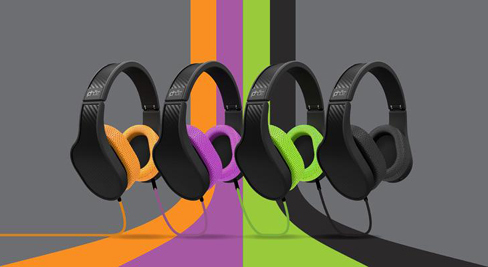 PHĀZ [pronounced phase] headphones approached me about designing headphones that showcased their patent pending “charge while you listen” technology. PHĀZ noticed that more and more consumers were listening to music and watching movies on the go. They had a vision to provide well balanced, top notch sound and an extra power boost for everything from long plane rides across the country to late night movie watching on Netflix. My goal with the industrial design of the headphones was to contrast restrained forms with exuberant use of luxury materials in order to visually represent the refined sound quality (restraint) and the unique charging feature of the headphones (exuberance). PHĀZ headphones feature genuine carbon fiber inspired by it’s use by car “tuners” and performance bike frames, high quality perforated synthetic leather inspired by it’s use in luxury automobiles, memory foam padding, a 15db bass boost, and on board amplification. JJR acoustics provided acoustic tuning and electrical engineering. Last but by no means least, the headphones are also incredibly comfortable and lightweight by design. I spent a great deal of time studying the ear cavity in particular to ensure that the headphones were comfortable for long periods of wear. In our research we found that the leading headphones often had excessive clamping force, ear cavities that were too small for even average sized ears, or excessive weight. 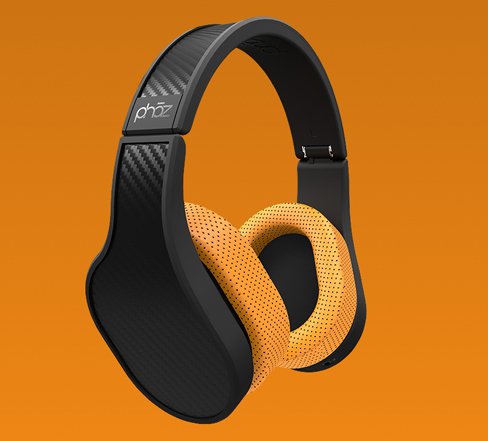 PHĀZ launched with much fanfare at the Consumer Electronics Show (CES) in Las Vegas in January of 2015 garnering coverage in top notch tech outlets such as Wired’s list of “11 more Cool Gadgets from CES”, and mentions on The Verge, and Engadget.